I haven’t been able to find the time to write more than one blog post a week lately, for that I apologize. The biggest reason for this is that I’m about to put my condo up for sale and I’ve been running around taking care of last minute things to get the place showing ready. My real estate gave me a list of things to do, she said there wasn’t that much, yet it seems to be taking all my time. I can’t imagine what having a lot to do would be like. This weekend I removed all the caulking from my bathtub and redid it. Caulking is not as much fun as it sounds. Removing it is long and tedious work, and applying it is a lot harder than the youtube videos make it seem. Thankfully I had a nice bowl of soup waiting for me when I was done with the silicone-ey mess. I had seen this recipe on Tartlette a year ago and it stayed in the back of my mind all this time. This weekend’s deep freeze seemed like the perfect setting for it. The soup is thick and creamy, even though there is no cream. Roasting the vegetables gives them a great almost caramelized flavour. It was a wonderfully soothing meal. I also made the polenta croutons she recommends from Lisa’s Kitchen. I generally don’t like polenta, but a corn flavoured crunch really appealed to me. I followed the recipe and used cayenne, but I think these would also be great with rosemary or thyme. 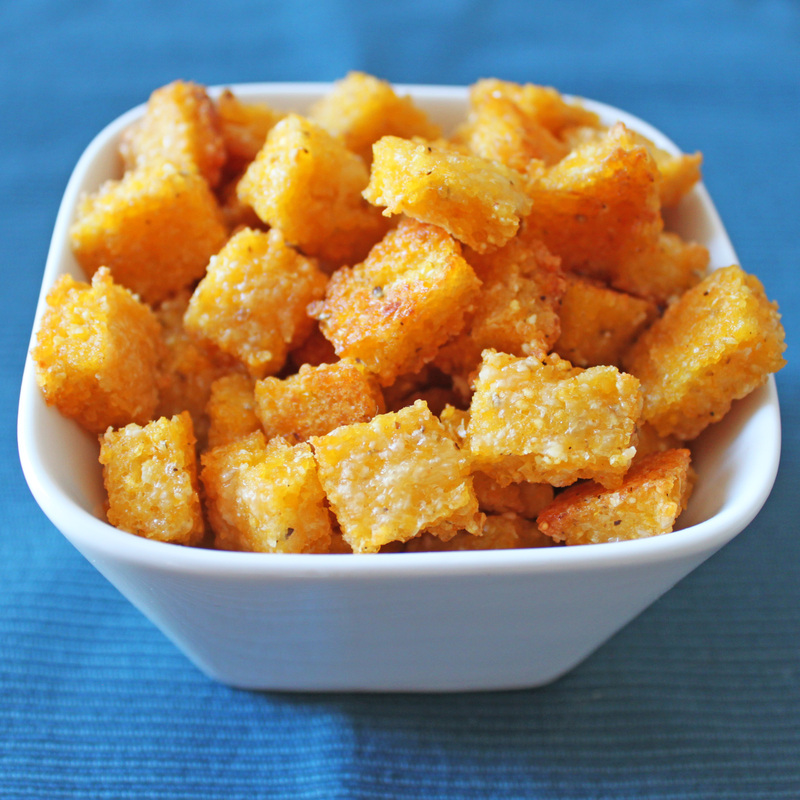 The croutons lost their crunchiness after a day, so if you make them, eat them all fast! Place the vegetables, onion and garlic on a baking sheet. Toss with olive oil, salt and pepper. Roast vegetables for 40 minutes. Transfer roasted vegetables to a large soup pot. Cover with stock. Bring to a boil then simmer for 20 minutes. Mmm…This vegetable soup sounds really different, healthy and yummy! Nice touch with the roasted vegetables. We make a Spanish warm salad with roasted vegetables; so pure them in a blender sounds like a logical next step :). Beautiful photos. Wow, once a week post is already fab. This looks delicious and the polenta croutons are definitely something temptingly different. Good luck with the condo! PS – Thanks for introducing me to polenta croutons. Brilliant! I think this might be the beginning of a wonderful friendship. Looks great! Thanks for sharing your recipes at dishfolio.com! We love having you as a member of our growing community. What a gorgeous and hearty soup! I love this! Those croutons look outstanding, great job! Phew, I don’t envy you the getting ready to sell your place. Or the caulking, that sounds like pure evil. But the soup looks wonderful and it’s all lovely low carb ingredients so I have saved it! I love unique soups. My bff would love this and the colors are so gorgeous! Well done! Soup with polenta croutons, oh yum! 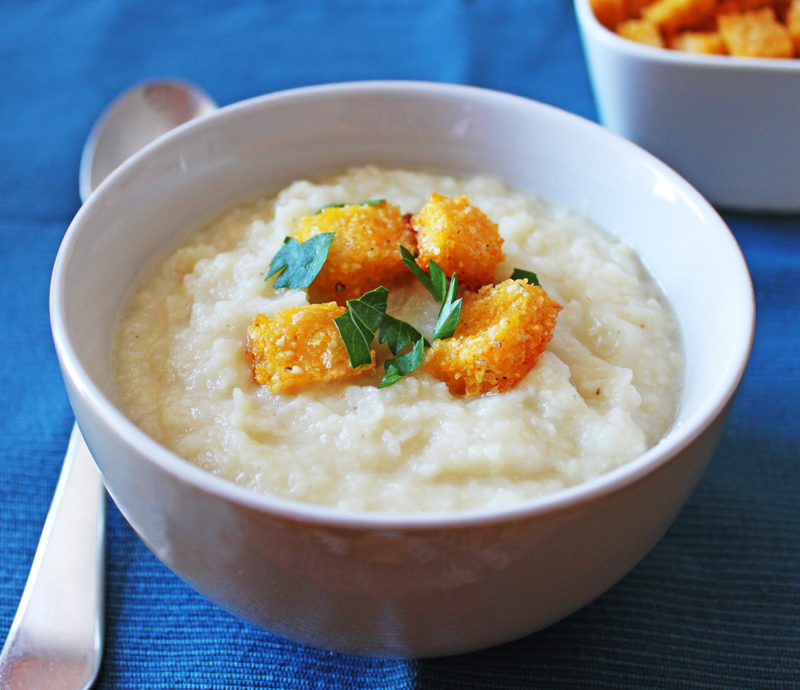 Those crispy polenta croutons look sooo good, that has to be a great with the creaminess of the soup. We’re actually going to re-caulk our tub tonight. I hate doing it. Ugh. I can see why you were relieved to sit down and enjoy this sensational bowl of soup. It looks wonderful. Polenta croutons with cayenne, yummy! I want some right now! Soup is great this time of year when its cold outside. We are getting pelted with snow and tons of ice now, ick! there is just a 40% chance of rain/showers. If you do decdie to come up make sure to dress in layers and bring a rain coat. If you guys can make the best of your day you will have a wonderful time rain or shine!